Norwich City midfielder Alex Tettey has likened his winner against Southampton on Saturday to those scored by Manchester City's Yaya Toure. 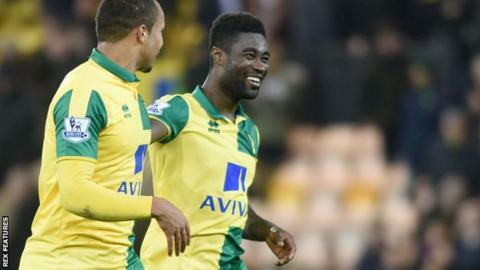 Tettey, who scored a "toe-poke" against Manchester United last month, side-footed home to give Norwich a 1-0 win. "If I score a goal it will be talked about. Today it was nice to do a Yaya Toure," he told BBC Radio Norfolk. "I was happy, when I made contact with the ball I looked up and it was just going in, it was a great goal." Victory at Carrow Road against the Saints was Norwich's third win in their last four Premier League matches and left them 15th in the table, six points clear of the relegation zone. That followed a run of one win in 11 in all competitions - and the upturn in form has coincided with goalkeeper Declan Rudd coming into the first team for the last six matches. "For the defenders and Declan as well, he's come into the team and got two clean sheets in a row now," said Tettey. "For the whole team we are really pleased - where we are, if you're letting in goals you are going somewhere you don't want to be. "And if you win and don't let in goals you are looking forward - that's what we all want."